Small Biz Thoughts by Karl W. Palachuk: SOP Friday: Getting Started in Business - Licenses, etc. SOP Friday: Getting Started in Business - Licenses, etc. One of the most daunting tasks when you set up your business is to make sure you have the licenses, tax identification numbers, and accounts. Luckily, most government agencies are pretty good with posting these on their web site. But you might not know that you need to go to their web site! Here are some tips for making sure you're legal and ready for business. We've already discussed Naming Your Business. The "form" of your business matters in this discussion because it will affect how you are taxed. At least in the U.S., a Sole Proprietor uses a personal Social Security Number as the Federal Tax ID. But here's the thing. There really is no Federal Tax ID. There's an Employer ID Number - EIN. If you are a Sole Proprietor but you have employees, you cannot pay yourself a "salary" through the payroll system. You simply keep the profits and you are responsible for making quarterly tax payments. But you pay your employees through some kind of payroll system. And for that you need a Federal EIN. Normally, you can apply for an EIN online and it will be issued almost immediately. The last time I did it, it took 15 minutes to receive my EIN. Every business entity (LLC, S-Corp, etc.) must have a separate EIN if you will be paying employees. Having said all that, when anyone asks you for your Federal Tax ID, you give them your EIN. For most people, that's pretty much all you need from the Federal government at this point. Assuming you're in I.T. consulting, you don't need permits for transporting explosives, alcohol, or other Federally-Regulated items. So now you can move to the State government. Somewhere on the IRS site you'll find a link to Small Business-Related Publications. As of this writing it is at http://www.irs.gov/Businesses/Small-Businesses-&-Self-Employed/Recommended-Reading-for-Small-Businesses. Browse through that and make sure that you have some idea of the rules and requirements that apply to your business. It should be clear right away that you need a good tax professional. Go get one if you don't have one. Some states issue a separate state tax ID. All of them use the Federal EIN or SSN as a reference point to cross-check your Federal tax return with state tax returns and other state activities. Here the world begins to get a little complicated. Your best starting place for information is the U.S. Small Business Administration web site. It is not always up to date, but they try very hard. And you are guaranteed to miss something if you don't check out their site. But there are lots of others that may apply. Start with the SBA and then find your individual state's web site. The good news is that most of the taxes and registrations you have to take care of are almost automatic when you take care of a few items. You also have to register your business somehow. If you create a corporation or other tax entity, that will be done at the state level. So you'll get a state Tax ID as part of that process. When you file state taxes, the forms will include required payments for misc. items. When you collect and file sales tax, all the little stuff you never knew was hidden inside the sales tax code will be inside the forms you complete. When you pay employees, you'll shell out money for Federal Unemployment, State Unemployment, Social Security, and a myriad of other taxes that employees don't realize you pay. Find the State web site that has all the juicy information and links related to business in your state. Every state is different. Some are very different. Again, read through all this and make links. It's up to YOU to make sure you're inside the law. State agencies have no obligation to inform you of your requirements. They just have the power to punish you if you do not comply. There are three common types of "local" government agencies in most states. There are Counties (or Parishes) that cover a fairly large area. There are Cities (and Towns) that cover a smaller area. And then there are Special Districts that cut across city and county boundaries. For example, a utility district might supply water or electricity in an area that crosses several city and county boundaries. School districts are often within a county or within a city, but also often cross those boundaries. The same is true with fire districts. Transportation districts almost always cross city and county boundaries. All of these districts might have taxes and regulations that apply to you. The two easiest places to start are the county and city. One or both of these will need to issue you a business license, which is just that: A license to do business in their boundaries. 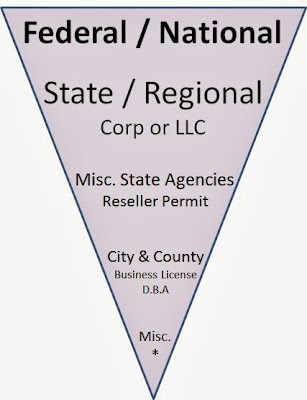 You might need to get business licenses in several cities if you provide services in cities other than where your business is physically located. One of these entities will also deal with a D.B.A. if you need one. That's a "Doing Business As" statement or Fictitious Business Name application. Basically, if you have one legal I.D. such as Joe D. Plumber and you do business as Super-Good Tech Support, that you need a D.B.A. One of these entities (city or county) is likely to have a good resource for all the local agencies and districts you need to deal with. Some will actually be able to accept forms on behalf of such agencies. Ideally, someone will point you to a golden web site that covers all the stuff you need to do to set up shop in your city/county. You guessed it. Find the local web site that has all the juicy information you need to stay inside the law and make sure you are paying all the little fees and taxes that are required. Truer words have never been said than "The power to tax is the power to destroy." And since you are responsible for these taxes and fees whether you know it or not, it's up to you to know. Another great resource in some locations is the local Chamber of Commerce. Sometimes, the local Chamber will have the golden web site you are looking for. Other times they'll be able to point you in the right direction. A Google search for "Starting a business in [state]" should get you to some good starting places. In addition to just paying taxes, you also have to make sure you're inside the law with all kinds of other things. You've seen the employment posters that take up the entire wall in almost every break room in America. You need those. - You might also need to be registered with the local fire department so they can do regular inspections. - You might need a license to do work in peoples homes or businesses. - You might have to register with an agency just to let them know that you are operating or paying wages within their district. Do your homework. Don't be one of the businesses that's driven out of business because you accidentally didn't file all the right paperwork or pay all the feeds. Relax Focus Succeed Revised Edition Released!